About this time of year, I start feeling like I'm in the movie Groundhog Day, in which the character finds himself living through the same nonsensical day over and over again. This photo appears to be a peaceful autumn scene in Princeton. Kids playing after school, a crossing guard waiting to help. But look again and you may see an accident waiting to happen, and a metaphor for how private interest dumps its problems on public space. 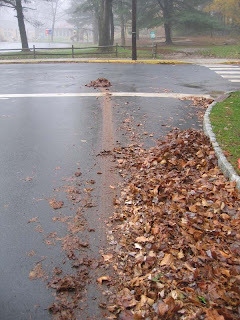 A landscape crew has just cleaned a client's lawn by blowing all the leaves on the street. The township ordinance forbids putting leaves on this street until a month from now, but the landscape crews are oblivious. It may not seem like a big deal, but here's a photo from last year. Add a little rain, a hurried driver, and you get a car skidding out into an intersection crowded with schoolkids twice a day. You also get nutrient pollution in local streams when the leaves start to decompose. 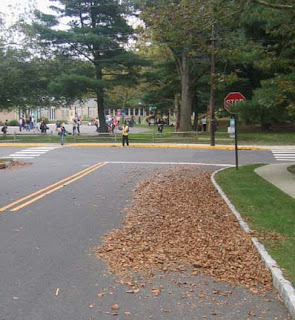 Add to that the constriction of the road, where cars and bikes try to maneuver between piles of leaves, and you have a problem. I've spoken to all the homeowners on this street. 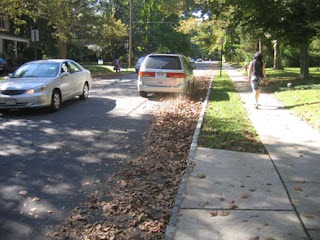 All are open to the idea of utilizing their leaves in their yards, rather than putting them out on the street. But in the meantime, the landscapers they pay to do their yardwork are doing what they've always done, which is to create a hazard by illegally dumping leaves on public space.